The solution to conveying system elbow wear at North Incinerator: Smart Elbow® deflection elbow in use in the lime injection conveying system. More HammerTek elbows were subsequently ordered and installed, gradually changing over the entire system. The Smart Elbow deflection elbow is available in a variety of materials and a wide range of pipe and tube sizes. For more information, contact HammerTek Corporation. At Montgomery County's North Incinerator plant, there was a problem several years ago. The Dayton, OH, area trash-to-energy plant was experiencing repeated shutdowns due to sweep elbow failure in its dense phase pneumatic conveying system, a component of the lime injection system in operation there. In order to meet EPA air pollution control standards for sulfur dioxide emissions, finely powdered limestone must be injected into all three of the incinerator units at the plant. 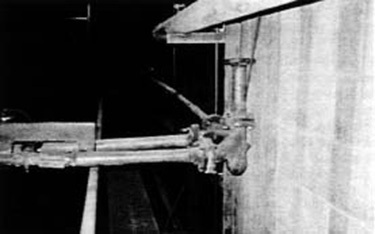 The long radius stainless steel sweep elbows were part of that lime injection system, and were unable to withstand the lime's abrasive action. The system must convey approximately 18,000 lbs. of powdered limestone every day, operating 24 hours a day, 363 days a year. At the pressure the lime injection system requires for operation, even a pin-sized hole in a sweep elbow will create a tremendous cloud of dust, and a considerable mess to clean up. According to Plant Manager Dave Martin, the system's existing stainless steel long-radius sweep elbows were wearing out every three months, necessitating system shutdown for repair. If the lime injection system was out of operation for more than a few hours, the EPA required the plant to shut the incinerator units down, resulting in approximately $40,000 per day in downtime expense. Always on the lookout for means of improving operations at his plant, Martin saw what seemed like a possible solution to the elbow wear-through problem at a major national trade show: the Smart Elbow® Deflection Elbow by HammerTek. The Smart Elbow design provides change of conveying direction in pneumatic and slurry conveying systems without the impact-related problems associated with virtually all other elbow types: excessive wear, plugging, and product degradation. The Smart Elbow product relies on deflection, not impact, to change conveying flow direction. 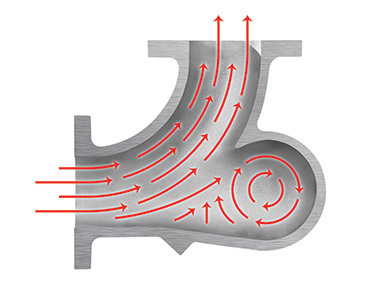 At system startup, a gently rotating ball of suspended material is formed in the patented vortex chamber at the back of the elbow, deflecting flow through the desired change of direction without impact, friction, or wear. 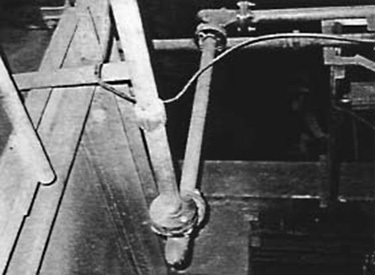 A single 90° HammerLast™ (acicular iron alloy) Smart Elbow model was installed: it outlasted the stainless steel sweep elbows and, years later, is still in operation. In addition to not having worn out in over two years of continuous use, the Smart Elbow deflection elbow was easy to install, according to Plant Manager Martin: "We don't have to cut and weld like we did with the sweep elbows; they just bolt right in. Since installation of the Smart Elbow models, we have saved on maintenance costs, decreased our downtime, and increased system reliability." The Smart Elbow deflection elbows have worked out so well at North Incinerator that they are currently being installed in a new higher-capacity lime injection system which will become the main system, with the present system taking on a back-up role. North Incinerator also plans to install Smart Elbow units in the facility's future fly ash handling system, currently in its final planning stages.